The new government of the United Kingdom has not yet indicated the kind of new relationship it wishes to achieve with the European Union. However, a crucial element of any new relationship will regard access to the EU’s single market. It is also noteworthy that both relative to GDP and relative to population, the UK pays less than Germany, France and the Netherlands. The UK even pays less than Italy relative to GDP, despite the fact that Italy is a less developed country than the UK. The reason for the UK’s low financial contribution is primarily related to the UK rebate on the EU budget , which was introduced in 1985 in order to reduce the UK’s contribution. 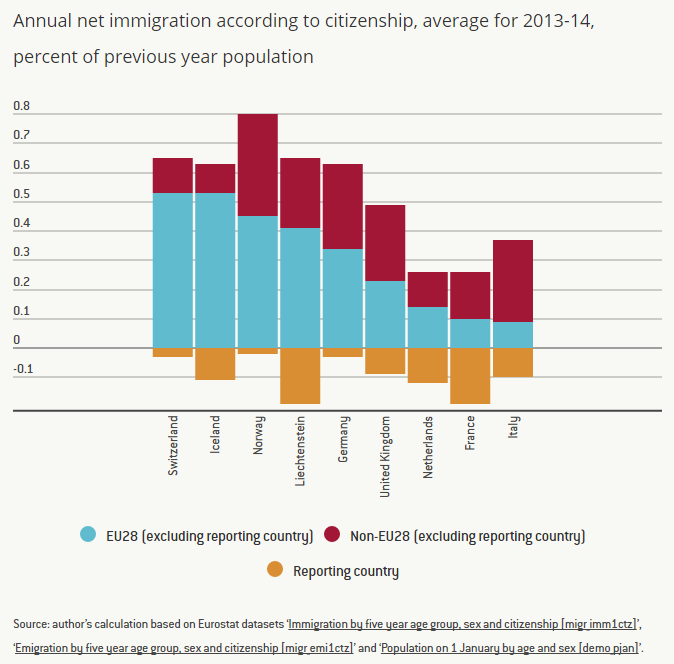 It is noteworthy that immigration from outside the EU was also sizeable in all nine countries included in the chart (note that the data refer to 2013-14, before the recent wave of large inflow of refugees to Europe). In the United Kingdom, more than half of immigrants were non-EU citizens: an inflow which was fully under the control of the UK government. It was therefore a UK decision to let non-EU nationals come to work in the UK, probably because immigrants brought major benefits to the UK economy, as I argued here . Switzerland is also obliged “ to take over relevant Community legislation ” in the sectors covered by the approximately 100 bilateral agreements that currently exist between the EU and Switzerland. 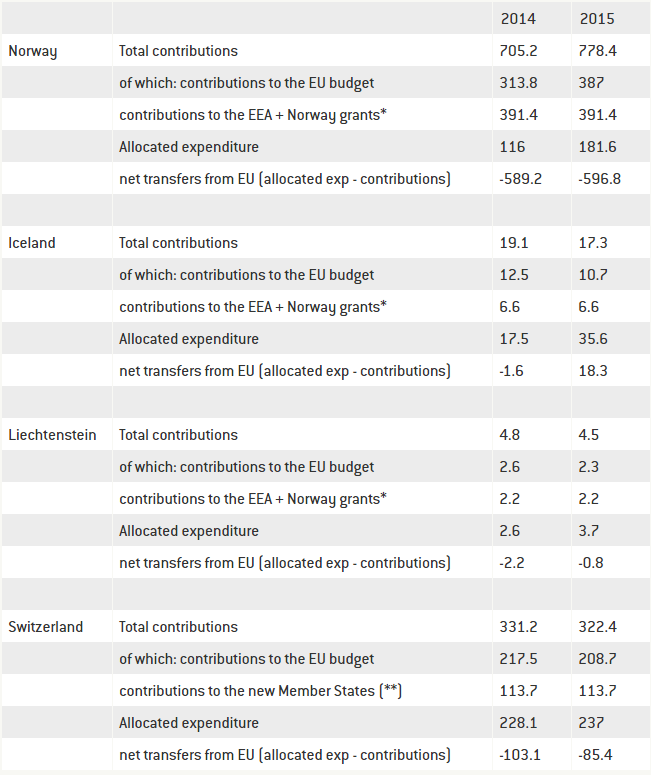 Sizeable net financial contribution to the EU budget (Norway pays similar amounts to current UK payments in relative terms, though Switzerland and Liechtenstein pay surprisingly small amounts. );Sizeable net inflow of EU workers and their families (relative to population, all four non-EU countries received about twice as many EU immigrants as the UK);The adoption of a very large share of EU regulations – without a voice in influencing them. Eurostat does not include EAS2010 GDP data for Liechtenstein, while ESA95 data is available only up to 2012. United Nations report GDP data in US dollars in 2010 and 2013: we converted the USD figures to euros, calculated the average annual nominal GDP growth in 2010-13 (which is 3.5% per year), and projected nominal GDP in euros in 2014-15 by assuming the same annual growth rate.